Opti's everywhere and a beautiful day here in Ventura, California for the 2018 USODA West Coast Championships. 2018 USODA West Coast Championships hosted at Ventura Yacht Club, Ventura, California. 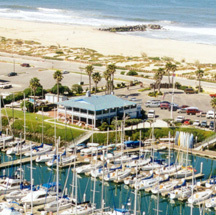 Ventura Yacht Club is a full-service facility located in Ventura harbor. Ventura Yacht Club maintains an active & multi-faceted junior sailing program. Junior members enjoy a variety of sailing experiences including summer camp sessions, "Sunday-Fundays", dinghy race team & keel boat options. Members have full use of boats on the premises & charter options for regattas. Our program goals are: to promote seamanship while building skills in all levels of sailing & water safety and to encourage the Corinthian Spirit. We are confident that your child will have fun while developing a life-long love for the sport of sailing. VYC maintains a quality fleet of Optimists, Lasers, and FJs. All instructors are US Sailing Certified. Carter Cox - VYC Junior Opti Sailor for 2014! Sydney Brea - VYC Junior Corinthian Sailor for 2014! 2015 USODA WEST COAST AUG 2015 COMPANIONSHIP RESULTS! Click here for Pictures !